SMS campaign is a text message sent to a large group of recipients usually for marketing purposes. Sales and discount messages are the most popular ones. SMS campaign is a crucially powerful strategy to deliver urgent information to people and it works best in combination with other marketing channels, such as email or web push. Everybody has a mobile phone these days and throughout the day we regularly check it. Chances are any business is able to find its audience via this marketing media. SendPulse offers SMS functionality along with other channels such as email and web push. With a useful and well-performing service, SMS campaign is easy set up and send. 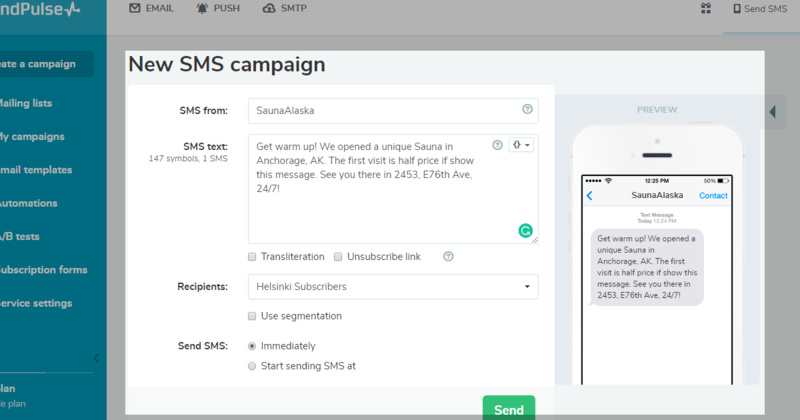 Let’s find out which problems SMS campaign solves, why it proves to be a multifunctional marketing channel, and what results you will achieve if you decide to take care of your SMS campaign with SendPulse. Extraordinary open rates. According to Gardner, SMS campaigns achieve extraordinary 98% open rate (ninety-eight percent, Charles!) and 45% response rate. These numbers are twerking. Drives customers to take action. SMS messages are effective since they create a feeling of time sensitiveness. In other words, SMS campaign informs people about a limited time to take action and if anyone wants to take advantage of the offer, they should hurry up. There’s no other marketing strategy except SMS campaign that can create a feeling of urgency so strong, that many decide to act rapidly. Easy & instant. Plain SMS is the standard while a marketing email is supposed to be well designed using HTML, so SMS takes only a few moments to create. Besides, the significant results are achieved much faster, because 95% of all texts are read within 3 minutes after being sent. It means that you can carry out your tasks in no time. Multifunctional. Desirable for any business. SMS marketing opens a vast field of opportunities for all sorts of business. SMS campaign informs about new products, services, allures clients with special sales and offers. It also can deliver updates and notifications or remind about the appointments. Besides, SMS campaign can be used to report some relevant news or for support and customer services’ improvement. Work well with other marketing channels. Did you know that SMS campaign can improve the results of an email marketing campaign? You can send SMS to “catch up” those people, who never opened your email. So, think through the usage of SMS campaign strategically, and support it with the efforts from other marketing channels. According to SendPulse, describing all the advantages of SMS marketing takes from 3 to 6 weeks. So let’s move on to a small piece of practice. As mentioned earlier, SMS strategy is best-performing as a part of a larger marketing strategy. Combine SMS and email marketing with SendPulse. After you’ve registered in SendPulse, you can import the phone numbers by adding them while creating a new mailing list (add them in a category ‘Phone’). Note, that you don’t necessarily need email addresses, you are able to fill in only the category ‘Phone’. Besides, the phone numbers can be added manually during the creation of an SMS campaign. Now as you’ve created a mailing list containing phones, move forward and launch an SMS campaign. Just follow the tips and you will get to the bottom of SMS marketing pretty soon. Segmentation. It’s possible (and recommendable) to use segmenting in both email and SMS marketing campaigns. You can select the required variables, like Gender, Country, Age, provided that you have this information on your subscriber list, and create slightly different messages to meet different people’s expectations at once. Check out if SMS segmentation really shows better numbers. Scheduled campaigns. 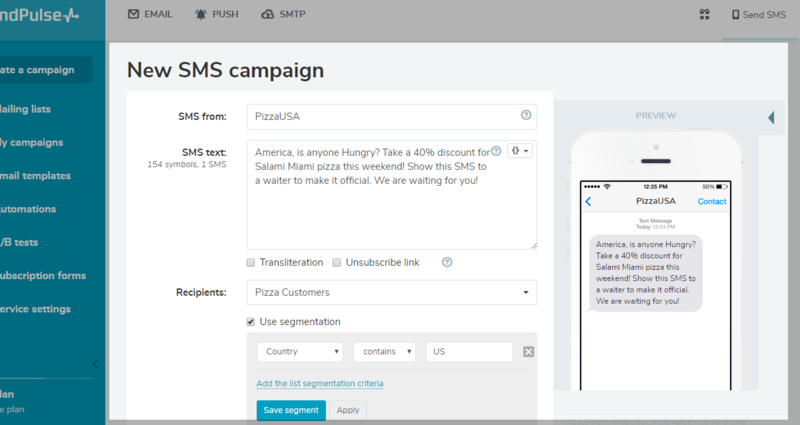 There are two ways to send SMS campaigns: you can send SMS immediately after you created a campaign, or you can lay it aside and set the exact time when to send. For instance, if you know that 3 pm is the best time for your audience to receive an SMS from you, set it at 3 pm and the campaign will be automatically launched right then. Previewing. 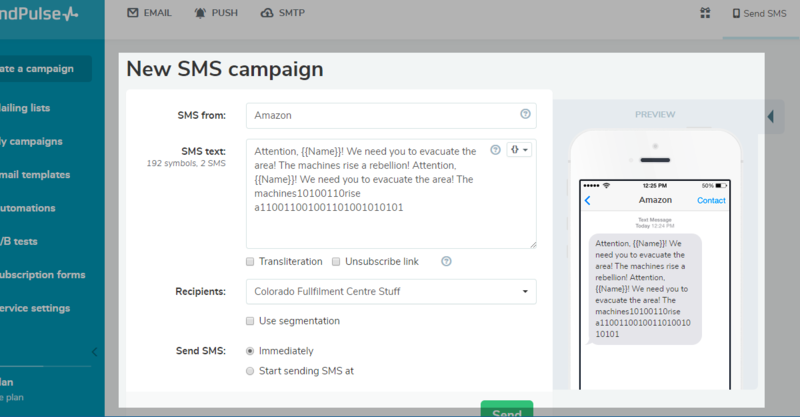 It is a wonderful chance to see how your SMS campaign will look like on the phone screen. You can just press the phone icon and preview your message. Let your audience opt-in. Some countries implemented laws similar to email SPAM-CAM Act into a phone industry. The most respectful and trusting way to build a good relationship with your audience is to give them a chance to opt-in. Perhaps you’ve already gathered phone numbers using a subscription form, but if your subscribers don’t expect to get SMS from you, they might be irritated. Asking people if they want messages from you is a gesture of politeness. Opted-in is the most valuable audience to communicate with. Find the right time. Obviously, the wrong time to send SMS is when people are commuting to and from their works. It’s from 7-10 am and 4-7 pm. And you’d better don’t wake your clients up at night: it’s rude and leads to unsubscribing. Any other time will do, as people contact with their mobile devices many times throughout the day. That’s the reason why 95% of SMS are opened in 3 minutes, remember? Make a smart and targeted copy. To reach your contacts, every SMS has to have a certain structure to be as efficient as possible. Put your offer at the beginning of the message and follow up with the CTA. People are busy, so lay your cards on the table right now, it’s a fair play. Come up with valuable offers for your audience. There’s nothing complex here. If the message is irrelevant, it’s boring. If it’s boring, it’s annoying. Nobody likes to be annoyed, so make sure you make a right proposal to the right people. Offer only exclusive deals. You see, if mobile users get the same promotions via email or on the website, there’s no sense in mobile messages from consumers’ point of view. SMS campaign must differ from proposals elsewhere. Provide people with something extra, and chances are you will get extra returns. Add a time-sensitive element. Your customers will squeeze in the time to take advantage of your proposal if you demonstrate it is helpful enough. Encourage them with a worthy discount, which spares soon. This should activate their interest. Segment SMS by location. Take advantage of geographical data, if you have gathered any. Tailored to the right people, your message makes them feel that following your proposal is a really smart move. Don’t forget to let them know where exactly they should go to “take what’s theirs”. It doesn’t matter whether it’s an offline shop or an e-commerce business. Put a strong CTA in your SMS. The customers are more engaged when they get a direct and clear call to action. It may be a certain condition, which enables the customers to complete a deal at the store. For instance, ask them just to show SMS to an employee to make it official, it will raise your chances to score. Personalize SMS campaign. As well as in email marketing campaigns, personalization improves conversion rates of SMS campaigns. If you have this data in your client base, why not put it to use? Also searched with "SMS campaign"
Rate this article about "SMS campaign"
If you are interested in "SMS campaign" you might be interested in our bulk email service.